Delta Virtual Air Lines is a non-profit organization and is made to give our pilots the most professional and realistic flying experience in the Mobile Flight Simulator, Infinite Flight. We have nearly 350 destinations along with over 1,500 routes. We are always open and welcoming to having new pilots join. Just simply fill out the pilot application and get a reasonable grade on your written test and you'll be a pilot in no time. Join us Today! Delta Virtual has been recruting pilots since late 2016. We are always looking for new pilots to join and soar the Infinite Flight Skies with us. Delta Virtual takes you around the world with more than 1,500 real-world routes based upon 14 hubs and hundreds of destinations that span the globe. 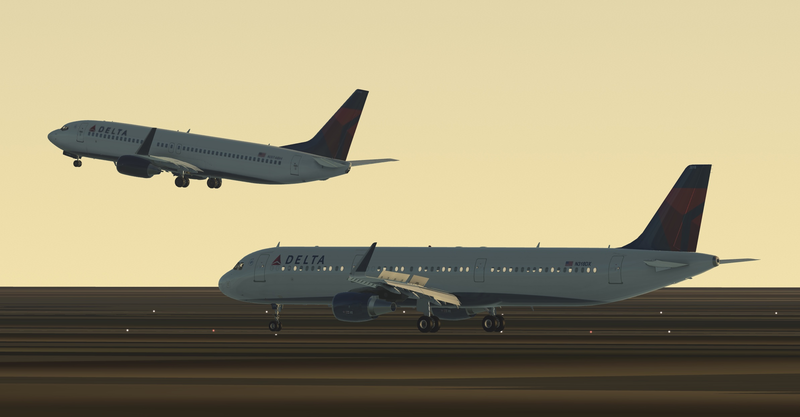 Come soar with Delta Virtual to see what is beyond the horizon on Infinite Flight. Ladies and gentlemen, the time has come. We have officially, as a Virtual Airline of the Infinite Flight Community, hit 100,000 hours as Delta Virtual! From its conception from @usa007, to the leadership and staff that worked on this VA before us, to the Board of Directors and Support Staff, there has been so much put into Delta Virtual that wouldn't be what it is today without their help. Special thanks to our pilots, our community, and our DLVA Family . Tonight's 100,000 hour, was logged by.... @MDoor [DLVA4254]! To celebrate our milestone, we are opening up our system to Delta Virtual! All pilots may log ALL DLVA flights using ANY Delta aircraft for the next seven days! This is a celebration of our colors! Please make sure the aircraft used can be used at the airport! We have a special celebration this Friday scheduled for the FNF featuring Delta Virtual. Here's to DLVA today, and DLVA into the future! Happy Holidays from Santa's Favorite Virtual Airline!